As mentioned in Some Definitions, intaglio engraving (cutting) results in “an image in relief,” as does cameo engraving. But intaglio is the opposite of cameo in that the “background is not cut away, but is left in the plane of the highest areas of the design” (Newman 1977, p. 159). Stone wheels are used. The resulting pattern is sometimes enhanced with cutting and copper-wheel engraving. Sinclaire and Spillman (1997, p. 21) have commented that “Pictorial cutting was sometimes called ‘intaglio cutting’ in the Corning area … and, at present, it is often used all over the United States to describe both copper-wheel and stone engraving.” Because the term “has been used and misused in so many connotations,” these authors decided to avoid using it in their book THE COMPLETE CUT & ENGRAVED GLASS OF CORNING (1979 and 1997 editions). In Great Britain the glass historian R. J. Charleston (1984, pp. 207-8) also found the term intaglio to be confusing, in spite of the fact that the technique, as applied to glass, was first developed in his country. In this file three examples of “intaglio” are presented, but only the first one — the British example — deserves to be called intaglio. Intaglio is a decoration obtained by the cutting action of a smooth stone wheel fed with a constant stream of water and worked by a power lathe. The article is held up against the under edge of the stone, similar to the operation of copper wheel engraving, the resulting decoration being very smooth in its cuts and easily polished when necessary. The glass-cutter differs from the engraver and intaglio workers by holding the article on the top edge of the stone and looking through the glass to do his work. It was very unfortunate that they [i. e., Stevens and Williams] were unable to protect this new branch of the trade [i. e., intaglio] by any patent. This was owing to the fact that cutting stones had been, and were still, used on [the lathe’s] spindle by glass cutters. They were useful for doing cut patterns of a small nature — too small for the ordinary cutter’s frame spindle; also they had to be used to cut a pattern on inaccessible places such as under the handles of jugs or on the underside of flanged lips of article, etc. Thomas-Williams continues: “The original intaglio decorating lathe, which is in the Science Museum at South Kensington, shows a rugged development of a copper wheel engraving machine, with the variable speed arranged by the use of two horizontally mounted tapered cones. It is simple, but effective” (Williams-Thomas 1983, p. 44). 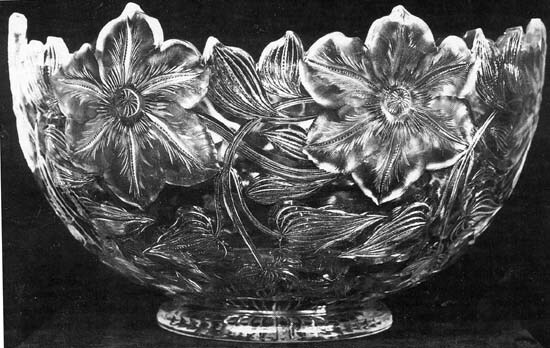 A 16″D Stevens and Williams intaglio-cut bowl, enhanced with a cut rim and copper-wheel engraved details (Williams-Thomas 1983, p. 47). The premier intaglio craftsman at Stevens and Williams was Joshua Hodgetts who may have produced this bowl. Four authenticated examples of his work are shown in Hajdamach’s book (1991, p. 221 and p. 288). All items are viewed from the cut sides, as is the above bowl. The Hodgetts examples clearly show asymmetrical “cuts” made at the intaglio lathe. They are analogous to the shallow “edge cuts” of the eighteenth century (see slice cutting) and can be considered typical of British intaglio of the late nineteenth and early twentieth centuries. Asymmetrical cuts are also found on copper- and stone-wheel engravings of this period, but they are not usually identified as intaglio cuttings. 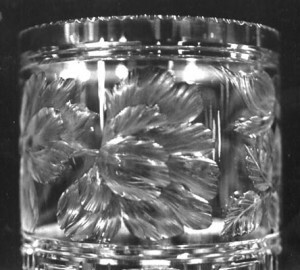 Unlike cameo glass, intaglio continued to be produced at S&W long after its heyday. Jim Millward in the 1940s and 50s and George Rowley in the 1960s are mentioned by Thomas-Williams as craftsmen who continued the intaglio tradition. “The process continues today with contemporary styles of design” (Thomas-Williams 1983, p. 47). Swan believes that her compote is reversible, with the hollow foot forming a vase. Baccarat makes no mention of this. In fact, Swan’s upside-down compote looks strange in that position. But such a “dual use” — real or imagined — always adds value to a piece of cut glass. In 1994 Swan’s “Libbey compote-vase,” although only 9″ high, had an estimated value of $1000 to $1200. 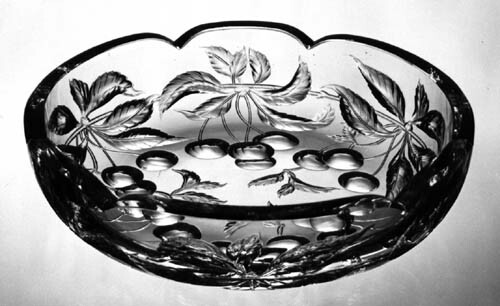 Shallow bowl cut in “Intaglio Cherries”, attributed to Baccarat. Acid polished. Note the three-dimensional appearance of the engraving as seen on the uncut surface. D = 9″ (22.9 cm), wt = 5 lb (2.3 kg). Sold in 1987 for $250. Do we have true intaglio in this country? Probably not, if Hodgetts’ work is considered the standard. Yet it is possible to find American examples of engraving that might at least be thought of as being “in the intagio style,” if one considers that a primary objective of intaglio is to produce realistic patterns that are three-dimensional, as in the Baccarat example. Unpolished (or semi-polished) stone-wheeled, realistic engravings by Tuthill, Hawkes, Sinclaire, and Pairpoint sometimes satisfy this criterion and they might, therefore, be considered to be “intaglio, American style.” For example, the (mostly) unpolished engraving of grapes and leaves in Tuthill’s Vintage pattern is distinctly three-dimensional when viewed from its uncut side (as photographed). The following example is viewed from its engraved (cut) side. Some collectors might consider that this deeply engraved “carning” is also an example of “intaglio, American style.” The photograph was taken at an antiques show. The 3.5″ (8.9 cm) band of engraving is located at the top of a cylindrical vase that is shown in a Pairpoint catalog (CMG microfiche F-2973, 8 of 10) where the pattern is labeled Cut Flutes and Prisms and Engraved No. 42. The flutes and prisms refer to the portion of the vase that is below the engraved band and is not visible in the image. The engraved pattern is not repeated; there is a fully open rose on the opposite side of the vase. The engraving shows the detail that is possible using stone wheels, here enhanced by careful, shaded polishing. Priced at $30 the vase was produced in one size only, on shape no. 1038. The engraving appears to be a version of the “Rose” pattern, pat. no. 39,994 of 18 May 1909, designed by Albert Steffin. Pairpoint catalog sheets reprinted by the American Cut Glass Association  show Engraved No. 42 as “Rock Crystal Design No. 42” on a group of smelling salts. The engraving appears identical to Engraved No. 42. The “rock crystal” designation probably is used to indicate that the engraving is polished. Presumably the engraving was done on a lathe, not a cutter’s frame. H = 14″ (35.6 cm), D = 5″ (12.7 cm), wt = 6.25 lb (2.8 kg). 48-pt star base. The vase sold for $450 in 1985.